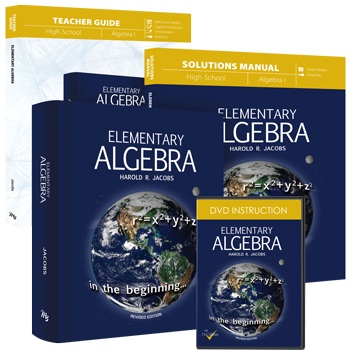 Jacobs' Algebra equips students with a solid understanding of Algebra 1. The clear, conversational, and engaging lessons are divided into 17 sections covering functions & graphs, integers, rational numbers, exponents, polynomials, factoring, fractions, and more! 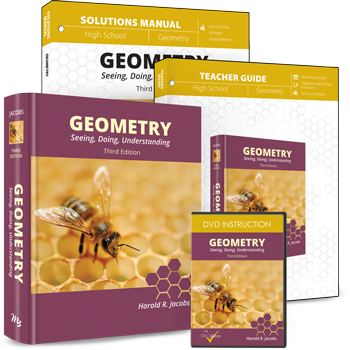 Jacobs' Geometry guides students through practical, real-world Geometry, helping them develop a true understanding of deductive reasoning, lines & angles, congruence, inequalities, quadrilaterals, area, triangles, circles, theorems, polygons, geometric solids, and more!